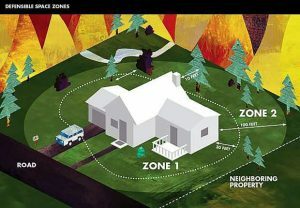 A schematic of the proposed Martis Valley West Parcel project. 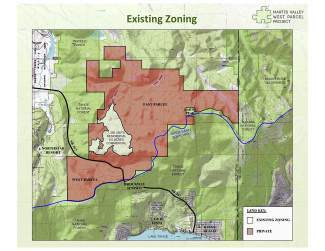 The Martis Valley West Parcel Project proposes shifting a development designation from a large parcel east of Highway 267 to the west for conservation purposes of 6,376 acres to create 50,000 acres of contiguous open space from Martis Valley through the Mt. Rose Wilderness Area. Currently, 670 acres on the 6,376-acre east parcel is zoned for residential and commercial development under the Martis Valley Community Plan, which allows for 1,360 residential units and 6.6 acres of commercial area. The project proposes retiring 600 of those units and transferring the remaining 760 units and up to 34,500 square feet of neighborhood commercial to the west parcel, which will need to be rezoned to occur. Visit mvwpfacts.com to learn more about the project, in a website set up by project developer Mountainside Partners. Or, you can visit mvwpfactcheck.com for a different view on the project, in a website set up by various opponents. 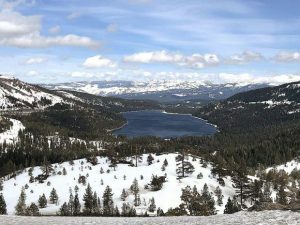 KINGS BEACH, Calif. — While proponents of a project that would rezone land in Martis Valley for development and conservation purposes are backing its environmental analysis, residents and conservation groups are criticizing it, saying additional study is needed. “One of the major problems with this draft Environmental Impact Report is it is not including the Brockway Campground,” said Isaac Silverman, staff attorney for environmental group Sierra Watch. “What we have are two projects proposed by the same developer on continuous landholdings owned by the same person. Common sense, CEQA (and) good planning requires an approach that considers the full impacts of these two projects together. Silverman was one of 10 people who spoke at last Thursday’s public hearing in Kings Beach on the draft EIR for the Martis Valley West Parcel Project before the Placer County Planning Commission. Released in late October and prepared by Ascent Environmental, the draft report found there would be significant and unavoidable impacts with the project related to cumulative night lighting, transportation and circulation, and greenhouse gas emissions. The Brockway Campground, meanwhile, is a separate project proposal that outlines up to 550 campsites and various amenities on a 104-acre parcel near Brockway Summit inside the Tahoe Basin — and adjacent to the Martis Valley proposal, which is outside the basin. Recirculation of the draft EIR? Despite Krieg’s comment, those who spoke at the public hearing raised cumulative impact concerns including traffic levels on Highway 267, greenhouse gas emissions and public safety in the event of a large-scale evacuation. Laurel Ames, of the Tahoe Area Sierra Club; Jennifer Quashnick, of Friends of the West Shore; and Ann Nichols, president of the North Tahoe Preservation Alliance, also requested a new draft EIR be recirculated. Last week’s hearing before the Placer County Planning Commission was informational, and no decisions or votes were made regarding the project. The deadline for public comment on the draft EIR is 5 p.m. Dec. 22. Comments should be mailed to Placer County Community Development Resource Agency, Environmental Coordination Services, 3091 County Center Drive, Suite 190, Auburn, CA 95603; faxed to 530-745-3080; or emailed to cdraecs@placer.ca.gov. Hard copies are available during normal business hours at the Kings Beach Library (301 Secline St.), Tahoe City Library (740 North Lake Blvd. ), Truckee Library (10031 Levon Ave.), Placer County Community Development Resource Agency (775 North Lake Blvd., Tahoe City), and in Auburn (3091 County Center Drive). Visit bit.ly/1jMDg56 to view an electronic copy of the draft EIR. Additional project information is available at mvwpfacts.com.